In a throwback to another era in cosmic history, astronomers on Monday discussed the birth of the universe in a 15th-century palace, the Palazzo Costabili in Ferrara, Italy, where the amenities do not include Internet access. The subject of Planck 2014, as the meeting is called, is a new baby picture — and all of the accompanying vital statistics — of the universe when it was 380,000 years old and space was as hot as the surface of the sun. The portrait taker was the European Space Agency’s Planck satellite, which spent three years surveying a haze of microwave radiation left over from the last moments of the Big Bang with a bevy of sensitive radio receivers. The data will not be published until Dec. 22 in the journal Astronomy & Astrophysics, and the lack of Internet access frustrated astronomers who had planned on watching a webcast of the proceedings but found themselves relying on Twitter feeds instead. At least, they reported, the coffee was suitably strong. The new data largely confirms and refines the picture from a temperature map of the microwaves that Planck scientists, a multinational collaboration led by Jan Tauber of the European Space Agency, produced in 2013, showing the faint irregularities from which gargantuan features like galaxies would grow. Its microwave portrait reveals a universe 13.8 billion years old that is precisely mysterious, composed of 4.9 percent atomic matter, 26.6 percent mysterious dark matter that is not atomic, and 68.5 percent of even more mysterious dark energy, the glib name for whatever it is that seems to be blowing the universe apart. Cosmologists still do not know what dark matter — the material that provides the gravitational scaffolding for galaxies — is, but the Planck results have increased their knowledge of what it is not, according to the French Center for National Scientific Research. Recently space experiments like NASA’s Fermi Gamma-ray Space Telescope and Alpha Magnetic Spectrometer have recorded excess cosmic ray emissions that, some say, could be evidence of a certain kind of dark matter particles colliding and annihilating one another. After Planck, we need another answer for those experiments, the French agency concluded in a statement. Planck dealt a blow to another possible dark matter candidate, namely a brand of the ghostly particles known as neutrinos. Physicists have known of three types of neutrinos for some time and have wondered if there were any more, whose accumulated mass would affect the evolution of the universe. Planck’s results leave little room for a fourth kind, so-called sterile neutrinos. Compounding the frustration of cosmologists in the room in Ferrara and at large was an issue that has galvanized them for the better part of a year: whether astronomers had detected the very beginnings of the Big Bang in the form of space-time ripples known as gravitational waves. Gravitational Waves per BICEP2 radio telescope. The added value of the new Planck data is a map showing how the microwaves are polarized, information that could shed light on what was going on when the universe was a trillionth of a trillionth of a trillionth of a second old, and in the grip of forces about which physicists can only speculate. Among the hottest topics of speculation these days is the idea — known as inflation — that the universe underwent a violent and brief surge of expansion in the earliest moments, settling the geometry and other aspects of the present universe. Such an explosion, theorists say, would have left faint corkscrew swirls, known technically as B-modes, in the pattern of polarization of the microwaves. In March there was much excitement when a team of American astronomers operating a radio telescope at the South Pole called Bicep2 announced they had detected such a pattern. Alan Guth of M.I.T., one of the inventors(?) [theorist would be better] of inflation, was at the news conference at Harvard announcing the results. After three months of spirited debate, the astronomers conceded, however, that their signal could have been caused by interstellar dust, which can also twist the microwaves. Enter Planck, which observed the microwaves in nine different frequencies, making it easy to distinguish dust. Bicep2 had only one frequency. A preliminary report from Planck in September confirmed that there was enough dust in Bicep2’s patch of sky to account for the twisting, but there are still large uncertainties that leave room for primordial gravitational waves. Subsequently, Planck and Bicep agreed to pool their data for a joint analysis. Planck scientists have meanwhile published their own polarization maps, which astronomers say will be useful for studying how the anti-gravitational push of dark energy and the gravitational pull of dark matter orchestrated the growth of galaxies and the universe when it was two or three billion years old — a sensitive age. The bumps in the microwave maps that eventually grow to galaxies amount to a temperature difference of only about 75-millionths of a Kelvin, in an otherwise uniform hiss. To measure polarization, radio astronomers have to discern temperature differences about a tenth of that. The difficulty of doing this research, while the world looks on, can be gauged by the number of missed deadlines. 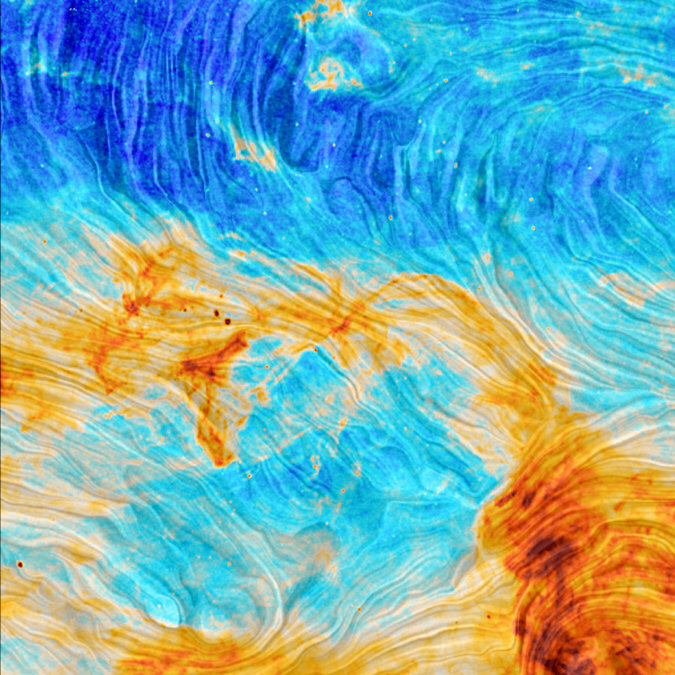 Planck researchers originally hoped to have their polarization studies done this summer. Recently they had set November as their deadline, aiming to present the results at this conference in Ferrara. Likewise, the joint Bicep/Planck paper is now expected this month or in January.